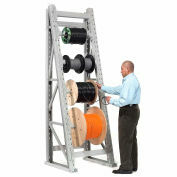 This sturdy steel reel rack has 6 levels that adjust on 1-1/2" centers and can hold up to 3 axles each. 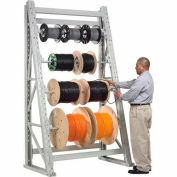 This model includes three 1/2" diameter axles and three 3/4" diameter axles for larger reels. Additional axle kits sold separately. 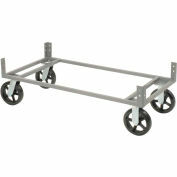 Can be customized to hold a total of 18 axles. 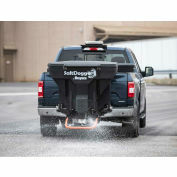 Boltless construction provides easy assembly and tool free level adjustment. 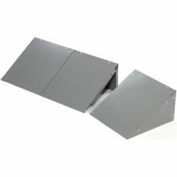 Secure to wall or floor for maximum stability. Chip resistant baked enamel finish. 1/2" dia. Axle holds 45 lbs (max), 3/4" dia. Axle holds 90 lbs (max). Your review: Excellent product. 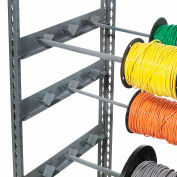 I can now get many reels off the floor and have better access. Does Global Industrial sell any shelves that can be placed on top of this reel mount rack? 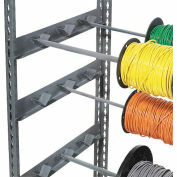 The rack has 8 holes, apparently for screws, along the tops of the borders, so it seems as if some sort of installation would be possible. 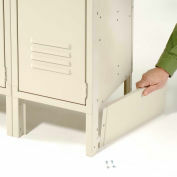 The added storage space would be very useful. 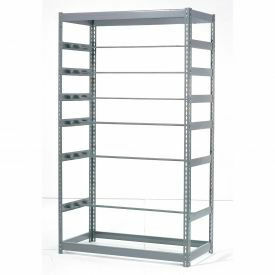 Hello Pedro, Unfortunately, we do not carry any shelves that can be mounted to this rack. I have forwarded this query to our sales team as they are better equipped to service your needs. They can contact you directly or you can call them at 1.888.978.7759. Thank you for your interest in our product!